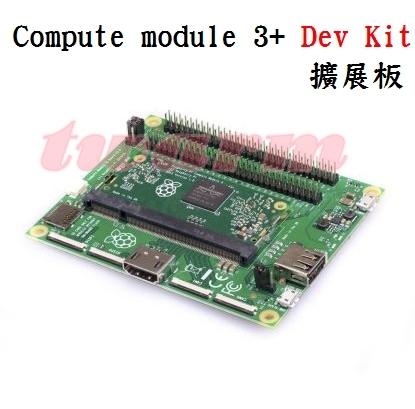 The Compute Module 3+ (CM3+) development kit includes everything you need to begin embedding Pi functionality into your design. The CM3+ is a prototyping platform aimed at business and industrial users. The CM3+ has the same core and features the Broadcom BCM2837B0 SoC from the Raspberry Pi 3 Model B+. The Pi Compute Module is smaller and can be integrated into designs. The module is based on the SODIMM standard so you can use standard connectors and embed into systems and other products. All modules are CE and FCC compliant. The Raspberry Pi CM3+ will remain in production until at least January 2024. The Compute Module IO Board V3 is a development kit for those who wish to make use of the Raspberry Pi in a more flexible form factor, intended for industrial applications. The IO Board V3 is made for developing with CM3, CM3L, and CM1. The Compute Module contains the guts of a Raspberry Pi 3 (the BCM2837 processor and 1GB RAM). The accompanying IO Board is a simple, open-source breakout board that you can plug a Compute Module into. The board hosts 120 GPIO pins, an HDMI port, a USB port, two camera ports, and two display ports. Designing the Module into a custom system should be relatively straightforward as we’ve put all the tricky bits onto the Module itself, and you have the freedom to add extra components and place parts exactly where your product needs them.